Sven Klomp designs exhibitions and is Attentive for the ordinary. He is Dipl.-Ing. Architecture FH and artistic director at Impuls – Design. He works as a scenographer, lecturer and project manager. Among others, for more than five years he supervised and realized the „Klimahaus® Bremerhaven 8°Ost“ . He is the regional director of the VerA (Association of Exhibition Designers in Germany) in Hamburg and founder of the Facebook-scenography-group. The most important thing for him is always the engagement and participation of the audience. Sven Klomp has been working in the field of scenography for more than 15 years. Already during his Architectural Studies at the University of Applied Sciences in Düsseldorf, he directed sound performances, among others, for the BDA – Federation of German Architects at the Gasometer Oberhausen and designed together with his wife Nina Nicolaisen exhibitions, for example in 1997 in the Ballhaus Düsseldorf Nur Fliegen ist schöner (Only Flying Is More Beautiful). 2001 he worked at the Schaubühne at Lehniner Platz Berlin. Here he made drawings during Sasha Waltz´s dance rehearsals producing a series of more than 300 drawings on the subject of “mass and movement”. In 2002, he expanded his formal language through the futuristic trade fair design at J.S.A. for Samsung. In 2003, Prof. Dr. Ludwig Fromm (Muthesius University of Fine Arts and Design Kiel) and Sven Klomp designed for „Studio Babelsberg“ the Zeitspeicher Papenburg. In 2005, the Danfoss-company-museum was opened in Denmark, for which he worked as a freelance designer at Gewerk Design in Berlin. From 2005 he worked on the Klimahaus Bremerhaven 8 ° Ost project (11,500 sqm / 26 Mio. €) for Kunstraum GfK for more than 5 years. The „Klimahaus“ tells a story about a journey around the world through the different climate zones. He first worked as a scenographer for the Klimahaus and then became the leading project manager. During this project he supervised and coordinated more than 50 companies. For him, this project also meant traveling to Alaska, representing the mayor of Bremerhaven, presenting the project to the citizens of St. Lawrence Island and talking with them about climate change. In addition to this further research trips to Switzerland and he supervised the production process in Bratislava. One of his current projects is called Attentive for the ordinary. 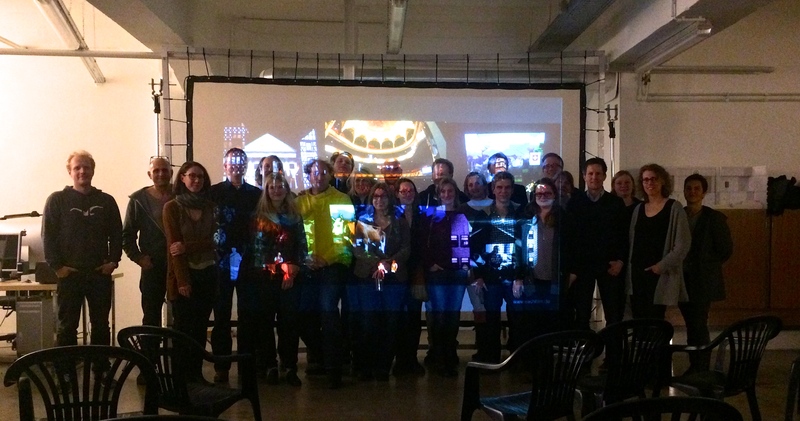 Together with Prof. Uwe J. Reinhardt (head of the edi – Exhibition Design Institute, Peter Behrens School of Arts Düsseldorf), he was invited by the User Experience Roundtable Hamburg to give a lecture about „scenography“. But instead of presenting a paper they persuaded the appr. 40 participants to design an exhibition spontaneously. The group went on a journey of perception with an unknown destination. They collected, filmed and photographed. An exhibition was created within 3 hours. Through this project, Sven Klomp was invited by the Muthesius University of Fine Arts and Design Kiel to lead an interdisciplinary workshop week. Furthermore, he was invited at the VLOW! Festival Bregenz and presented a workshop for design strategies with this concept. This project has become a strong pillar for him. He works with it in the most varied areas of education, business and culture. Through his many years of work as a scenographer and project manager, Sven Klomp knows how to inspire people and to lead interdisciplinary teams. Since 2014 he teaches as a lecturer for scenography, at the HS Hannover and at the FH Erfurt. He is the artistic director for scenography at Impuls – Design GmbH & Co KG and regional director of the Association of Exhibition Designers in Hamburg. The most important thing for him is always the engagement and participation of the audience. Since 2006, he has been living in Hamburg with his wife and three children. Aufmerksam für das Gewöhnliche – PLOT#11 – Brauchen Inszenierungen Raum? Since 2017 Member of Deutschen Museumsbund e.V.